"It’s Alive! and Drew Ford are proud to launch the Kickstarter to publish Red Range: Pirates of Fireworld...the first new Red Range story in almost two decades! And the first NEW comic book series from It’s Alive! 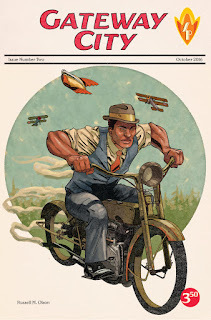 Keith Lansdale, the writer who recently brought you X-Files and Creepy stories, will unleash his imagination on the historical and somewhat Steampunk world his father (Joe R. Lansdale) and the late Sam Glanzman created back in 1999, in the form of a graphic novel. That book has since been colored, and republished by It's Alive!, and now it's time for the story to continue! RED RANGE: THE PIRATES OF FIREWORLD is a NEW comic book written by Keith Lansdale and illustrated by Jok, with standard and variant covers (seen below) by an amazing international group of artists, including Jok (Argentina), Russell Mark Olson (UK), N. Steven Harris (USA), Ramón Pérez (Spain), Christopher Schenck (USA) Aleksandar Bozic (Serbia), Dalibor Talajic (Croatia)"